Super Bowl parties are as much about great snacks as they are watching the game. So, with game day fast approaching, we at Maker’s Mark would like to share with you easy ways to can kick-up fun finger foods with bourbon, as well as how to mix the perfect cocktail to serve with them. 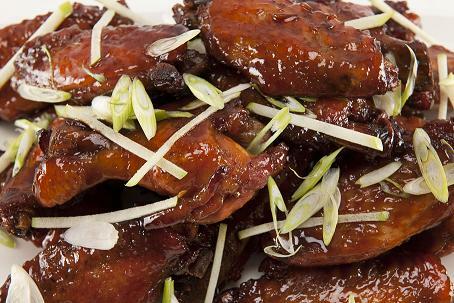 Notes: These tangy sweet wings get the benefit of being braised then baked, no frying involved! 1. Combine all of the ingredients in a medium pot. Bring to boil on high heat and then reduce to a simmer for 30-40 minutes until the wings are tender and the glaze has reduced, coating the wings. 2. Preheat the oven to 325°F. Remove the wings from the pot and transfer to a parchment lined sheet tray. Bake for 15-20 minutes until the wings begin to color and the glaze becomes shiny. Garnish with minced scallions and apple. Serve immediately.